The Internet of Things (IoT) can be defined as a system of interrelated and connected computing devices, mechanical and digital machines, or people and whose access rights can be regulated and monitored to transfer data over a network without requiring human-to-human or human-to-computer interaction. IoT plays an important role in today’s health care system to better serve and treat the patient by centralizing their history and enable better coordination among various departments. Globally increasing penetration of connected devices and better connectivity is expected to be the key driver for IoT during the period of study. This report identifies the Internet of Things in healthcare market size in for the year 2014-2016, and forecast of the same for year 2021. 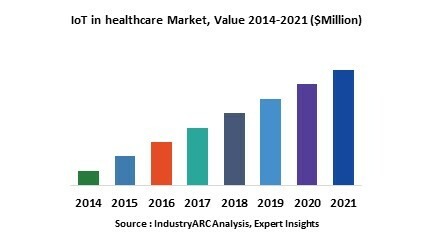 It also highlights the potential growth opportunities in the coming years, while also reviewing the market drivers, restraints, growth indicators, challenges, market dynamics, competitive landscape, and other key aspects with respect to Internet of Things in healthcare market. Globally North America dominated the market for Internet of Things in healthcare in 2015 with highest market share due to well established healthcare setup, higher penetration of internet connectivity and tech savvy population in the region. North America was followed by Europe as the second largest regional market for Internet of Things in healthcare. However, Asia-Pacific is expected to be fastest growing regional segment during the period of study due to fast growing internet penetration in major markets like India and China along with rapidly developing healthcare infrastructure in the region. This report on global Internet of Things in healthcare covers different components of Internet of Things in healthcare and application of interned of things in the healthcare industry and market size in various geographical regions. This is report has been further segmented into major regions, which includes detailed analysis of each region such as North America, Europe, Asia-Pacific (APAC) and Rest of the World (RoW) covering all the major country level markets for Internet of Things in healthcare in each of the region.